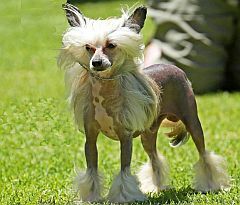 Chinese crested dogs are descended from the African Hairless Terrier. 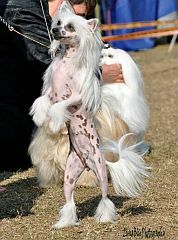 They were taken to China by sea-farers where they got the name, "Chinese Crested." The "crest" is a tuft of hair on the head. 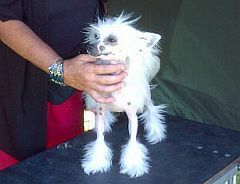 The Chinese crested dog is almost hairless, so should be kept out of the sun. Use sunblock if you are taking the dog out. A coat is necessary in winter to keep the dog warm. The hair is sparse the body except for the tail and lower legs. The skin colour can be flesh-coloured, black, or spotted. Some breeders shave the hair to expose more bald skin. Powderpuff is another variety of the breed, which has long hair all over the body which needs brushing. Both powderpuffs and hairless dogs are found in the same litter. The appearance is genetic. The hairless dog is good for people who are allergic to dog hair. Another plus is they don't get fleas. This is a good breed to keep indoors but they do enjoy running around a garden and going for walks. 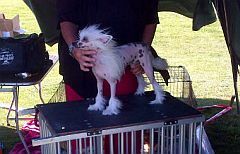 There are few breeders of Chinese Crested dogs in South Africa, so be prepared to wait for a puppy. God knows all about the dogs (& people) He created. He knows how many hairs we have on our body on any given day. It must be easier for Him to count the hairs on a hairless dog than a powderpuff dog! Today, let's walk tall in the knowledge that God knows us and is watching us every minute.